The name Bantham is derived from the Anglo-Saxon word “ban” or “bent”, the marram grass which holds the dunes together, and “ham” meaning dwelling-place. The hamlets of Bantham and Buckland form part of the Parish of Thurlestone, and it was at Thurlestone the Parish Church was built. There was a promontory fort on the Ham in the Bronze Age (around 2000-500BC) and during the great storm of 1703 the site was uncovered. Subsequently, Roman, Saxon and Dark Age (500-600AD) artefacts have been found there. 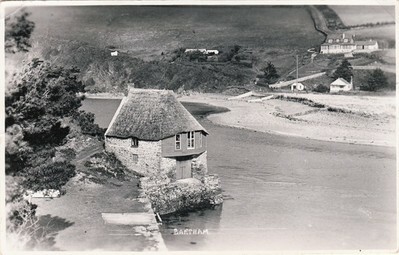 In the Bronze Age, Bantham became the place for trading Dartmoor tin and other goods with Europe. ​Over the years those living by the sea had much to fear from the incursions of Viking invaders and, in 1067, Irish marauders. In turn seamen learned to fear the villagers, for wrecking, or ‘wracking’, ships became a profitable side-line. Vessels were lured to destruction on the dangerous rocks which surround the coast, then looted and often all the survivors slain. By the 1800s Bantham had a population of around 100, a little row of white-washed cob and lathe cottages, a coastguard station, a smithy, bakery, shop, and a 14th century inn, The Sloop, which had its own currency - a Sloop coin - used by local farmers to pay their workmen overtime and which could only be spent at the inn! Most of the men were farm workers or fishermen. Tubs of smuggled brandy from France were regularly hidden at the blacksmith’s forge at Whiddons or under large clumps of seaweed on the beach. Up until 1866, when they ceased to come, pilchards were the main catch and at Pilchard Cellars they were pressed and cured before being exported. ​There were not many visitors to the village in those days but a few people came from Kingsbridge at Bank Holiday times and once a year a river barge outing, complete with piano and harmonium, brought the Wesleyan Chapel congregation from Aveton Gifford to picnic at Bantham. The only known source of entertainment was a visit to the parish on several occasions by a man with a dancing bear. In the 1800s particularly, the parish worked as a whole, each of the three villages in the parish having its own selection of necessary facilities to complement those of the neighbouring village. Thurlestone was only a small village with a Church, a village shop and four farms, being its main industry. Buckland had a Wesleyan Chapel, blacksmith’s shop, rifle club, cider press, 4 farms, a Mill, a butchers shop, slaughterhouse, a cobbler, a carpenter/undertaker, a poor house and a barber who only cut hair at weekends. There was also a willow plat on the lower road for making lobster and crab pots and a shared allotment for the village. At Bantham, water came from the village’s several springs and lighting from oil lamps and candles. Food was cooked on open fires and bread made in the ovens set into the wall next to them. In the 1900s, Squire Brunskill, to celebrate his 80th birthday, gave every villager a cast iron Lidstone stove, fuelled with wood or coal, which made life much easier. Two of these original stoves remain. ​Provisions were distributed round the parish by a man called Carrier Sherriff, his donkey being laden with wicker panniers full of breads and other foods. 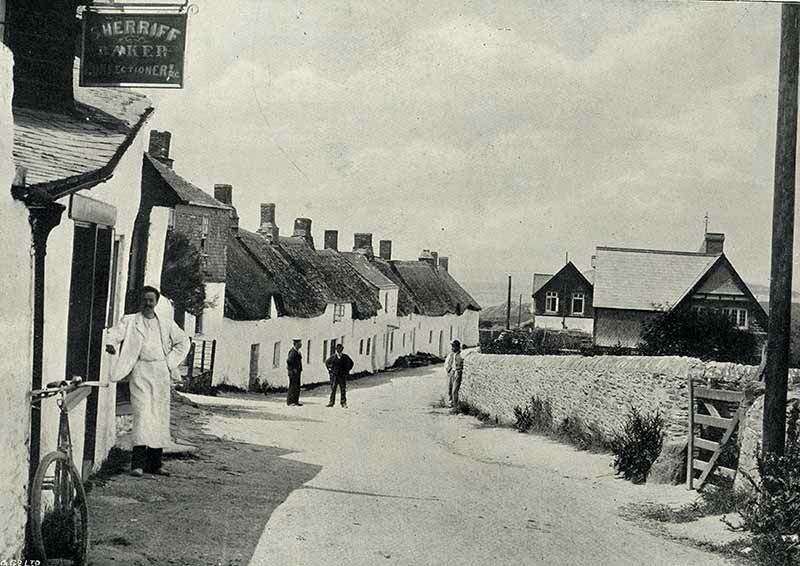 The only shop in the village around 1900 was called ‘Sherriffs’ and run by a man of that name, probably the carrier’s son. 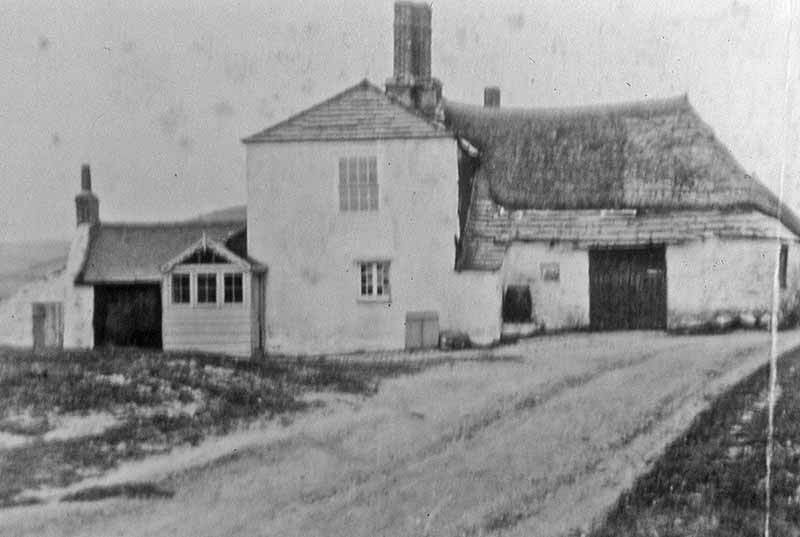 He was a baker and confectioner with a shop next door to Bantham House on the corner of the lane to West Buckland – now known as Old Shop Cottage. He would ride about the village in his long white apron delivering his bread and cakes. The place known as The Wall was the ‘esplanade’ of Bantham, where villagers would rendez-vous, the fishermen would debate whether the bar was safe for setting sail, the coastguard would sweep the horizon with his spyglass and the locals would dry their bathing costumes and towels after a dip. 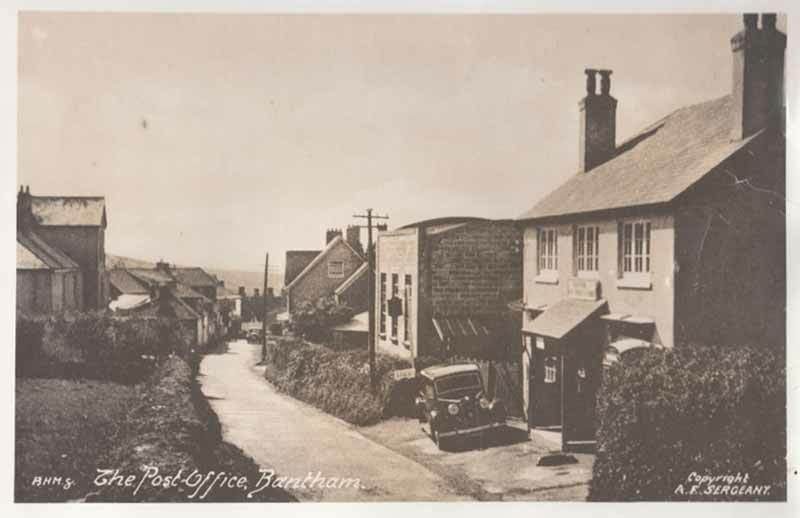 Bantham was a busy little port with passenger paddle steamers calling from Plymouth regularly, sloops and barges bringing in such things as coal, farm implements and fertilisers, and making the return journey carrying farm produce. Barges brought in limestone, which would be burnt in Kilns and made into powdered lime used for building and fertiliser. Shire Horse and cart would collect the limestone from the Quay and take it to be burnt. 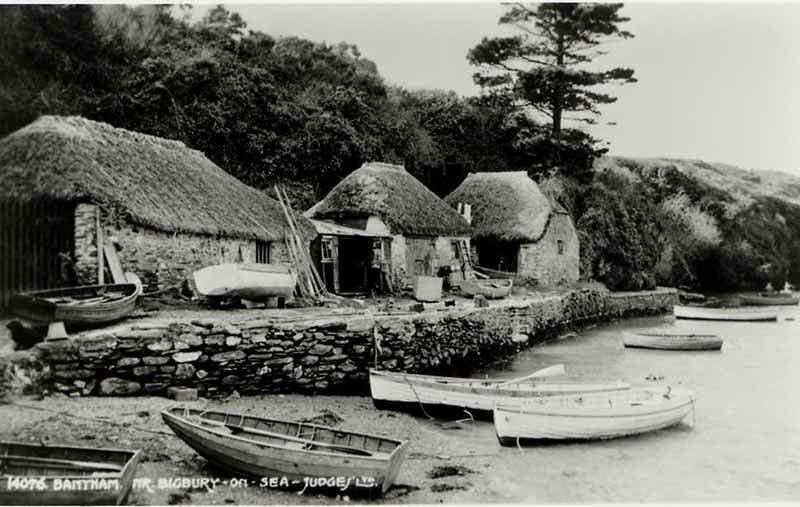 From there it would be shoveled into the carts and taken up the path from the Quay and along the lane below ‘White Horses’ to the farms at Aunemouth and West Buckland. The old Lime Kilns still stand at intervals along the river, but are now rapidly falling into decay. Horse and cart would also collect seaweed from the beach to fertilise the land. By the 1950s silting of the estuary following the building of the Avon Dam and the development of overland transport sadly put an end to all of these activities. Lieut. Commander Charles Evans bought Squire Brunksill’s estate in 1918, and Evans Estates have remained the caring custodians of Bantham village from then until its sale in 2014. Residents keep the past alive in their celebration of local heritage and the strong sense of community that exists here. Article written by Milla Bassett and edited by Pat Macdonald. Photographs from the Peter Hurrell collection - click on photos to enlarge them.